Cross App Connect allows TrackVia users to share resources among multiple TrackVia applications. For example, instead of having an Employees table with duplicate data in two different TrackVia applications, Cross App Connect allows for one shared Employees table. Duplication, as well as the errors that go along with it, is eliminated. Connecting Applications via Cross App Connect is easy, but users must have Super Admin status to do so. In this example, the Employee Table in the Employees App will be shared with the Jobs App. First, create the Employee Table in the Employees App. Next, create the Jobs table in the Jobs App. The Employees Table now needs to be shared with the Jobs App. This can be done in a couple different ways from the Jobs App. Option 2: From the Table Relationships editor in the Jobs App, select the "+ Add Table" button and then the “From Another App” option. Whichever option is selected, the “Cross App Connect: Connect a Table” screen will open. On this screen, choose the Application (App) which contains the source table (Employees, in this case) and then select the table to be connected. Once the table has been selected, click the “Connect Table” button. 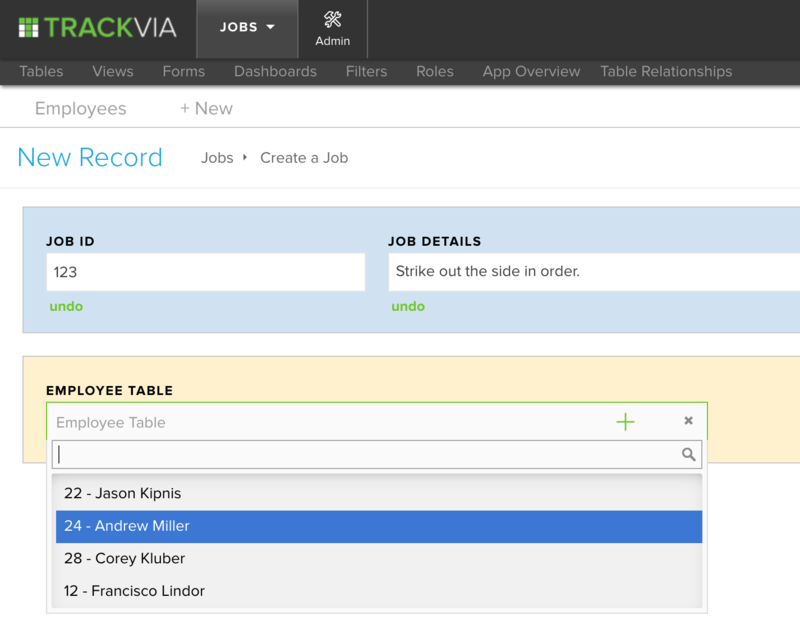 The Table Relationships editor of the Jobs App now shows two Tables. Note that the Employee Table has an icon to indicate it is shared across Applications. A relationship can now be made between these two tables. Because one employee may be associated with many jobs, the Employee Table would be the parent and the Jobs table would be the child. Records in the Employee Table now are available for selection when adding records to the Jobs table. 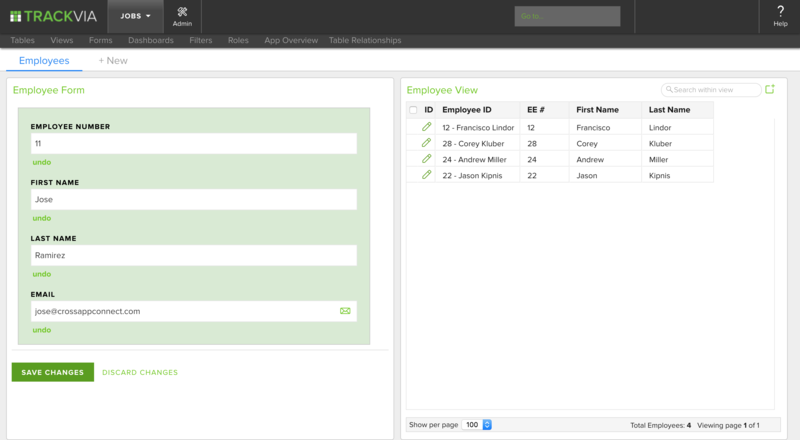 In the Jobs App, it is also possible to create forms and views for the Employee Table. These Forms and Views are also now available in the Employees App. Any Filters created on Views of the connected Employee Table are also shared across Apps. Although these resources are shared across Applications, Admin Users can still control access to shared resources through Roles and Permissions. For one table, it’s even possible to give Admin access to a Role in one App and no permission to edit the table in a different App.